By Daniel Horowitz--Since 1974, UJA Federation’s Ontario Jewish Archive's "Sense of Spadina" Tour has been exploring Jewish Toronto’s historical Spadina Avenue area, teaching thousands of participants about the rich, proud history of the old Jewish neighbourhood surrounding the famous street. From the 1920s until the 1950s, the area was home to Jewish residents and businesses and was the focal point for social, cultural and religious activities within the Jewish community. Following the Second World War, Toronto's Jews began to move out of the area, up the Bathurst corridor, and were replaced by new immigrant communities. But remnants of the former Jewish presence remain as a reminder of the community's vibrant past. 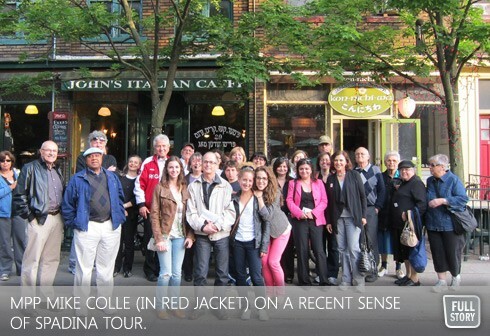 On the last day of May, 2012, the first ever Jewish Heritage Month in Ontario, it was fitting that the tour – led by OJA tour guide Cyrel Troster - included a very special participant among its 36, Eglinton-Lawrence Liberal MPP Mike Colle. It was Colle who, along with Thornhill Conservative MPP Peter Shurman and High-Park New Democrat MPP Cheri DiNovo, jointly sponsored Bill 17, the Jewish Heritage Month Act, which passed unanimously in the Ontario provincial legislature on February 23, 2012. The inaugural Jewish Heritage Month, which saw 15,000 participants take to the streets of downtown Toronto for UJA’s Walk with Israel, and a capacity crowd fill The Sony Centre for the Performing Arts for UJA Federation’s Evening with Israel’s President Shimon Peres, before wrapping up with The Sense of Spadina Tour, was a tremendous success. “I am absolutely thrilled that the OJA partnered with MPP Mike Colle on this wonderful evening of exploring the old Jewish neighbourhood of Kensington Market,” said Dara Solomon, Director, Ontario Jewish Archives. The Sense of Spadina Tour began at the Anshei Minsk Synagogue on St. Andrews Street -- one of two historic Orthodox synaogogues in the Kensington Market area -- and winds its way through the intimate streets east of Spadina Avenue. En route, participants visit the former sites of the Labour Lyceum, United Bakers, the Standard Theatre, Eitz Chaim Talmud Torah, Mandel’s Creamery, Beth Jacob Synagogue and many other important buildings which housed and serviced the early Jewish community. The tour ends at the Cecil Street Community Centre, which was once the site of the Ostrovtzer Synagogue. For MPP Colle, the tour conjured up images of what he thought life would have been like in Kensington Market decades ago. “I imagine how warm and family-like life must have been in the 20s and 30s,” said Colle. “People must have felt at home with all the Yiddish newspapers, Yiddish merchants, Yiddish culture and so many synagogues. It must have been wonderful to live and work in such a welcoming neighborhood, despite not having many luxuries. The Market continues to be such a special place because it’s been an entry- point for so many immigrants throughout Toronto history. It is as though you can still hear the music, singing, and prayers that emanated from the area. It is important to protect and preserve the neighbourhood and to tell these amazing stories.” As for his role in bringing Jewish Heritage Month to fruition, MPP Colle is clearly proud. “I am so grateful that people have come up to tell me how meaningful it has been,” he explains.